The crew of a Disney cruise ship rescued two people from a distressed vessel in the Bahamas this week, a cruise line spokeswoman confirmed. Spokeswoman Rebecca Peddie said the Disney Dream responded to a distress call from a small boat, carrying two U.S. citizens, on Wednesday afternoon. The rescued people were brought aboard the ship and provided medical attention and food, Peddie said. The cruise line notified the U.S. Coast Guard, she said, and the pair returned to Port Canaveral onboard the Dream on Thursday. 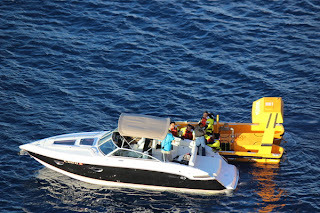 "We are proud of our Disney Dream crew members, who skillfully demonstrated their training and commitment to maritime protocols around saving lives at sea," the cruise line said in a statement. Tressler who was a passenger said the cruise was in its final day when the captain alerted passengers to the nearby distress signal by intercom. Passengers and some crew headed to the open decks to watch the rescue, he said. "It was obvious that the boat was in trouble, sitting dead in the water," Tressler said. "Some speculated that it had run out of gas. It was apparent that there were no major medical issues." After the rescue, he said, cruise passengers "reacted with a roar of approval, clapping their hands for several minutes." Tressler, a U.S. Navy veteran, described the rescue as a good learning opportunity for his 10-year-old son, Daniel III. Tressler, a U.S. Navy veteran, described the rescue as a good learning opportunity for his 10-year-old son, Daniel III. Dream crew members in a yellow vessel rescuing the boaters.